We take great strides to see that your doors are ADA plus fire compliant, checking seals & gaps, checking the opening force, door and wall rating. Diamond State Door supplies and installs a full line of custom or standard hollow metal doors plus frames for new or additionally retrofit construction projects in the commercial, educational, healthcare, hospitality and retail markets. The trained service technicians here at Diamond State Door are ready to meet your needs by installing expertly crafted hollow metal and steel entry doors. We’re available 24 hours a day, seven days a week to fix or replace metal doors for commercial, residential and industrial clients throughout the Delaware Valley. 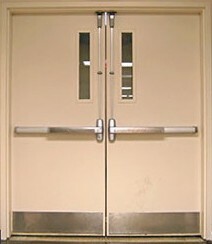 Hollow metal doors are perfect for school entrances, warehouses, buildings for manufacturers, emergency exits, courtrooms, office buildings, apartments, military installations, airports, and hotels. Why choose Diamond State Door for your Metal Door needs? Our trained service technicians are available 24 hours a day, seven days a week to solve your door problems. We use expert-crafted products, and install them with your safety in mind. But that’s not all.